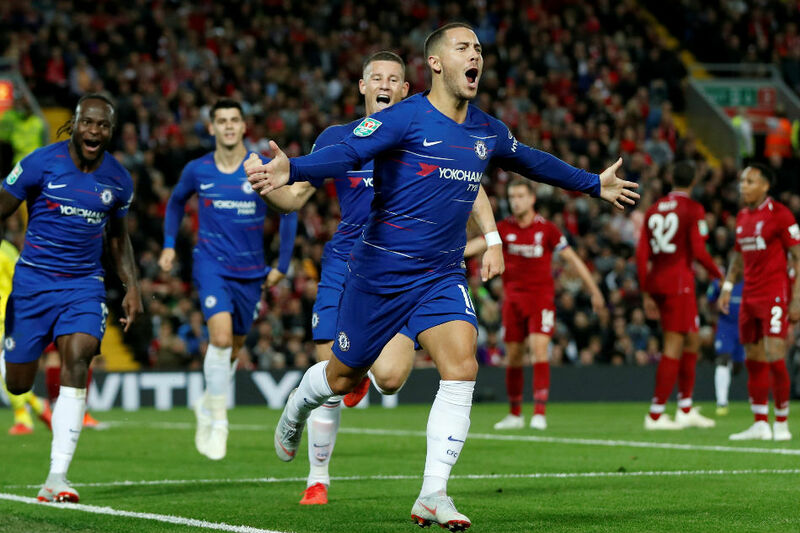 Boasting arguably the best player in the Premier League in Eden Hazard and an unbeaten start under new coach Maurizio Sarri, Chelsea have emerged as surprise challengers for the title ahead of their meeting with leaders Liverpool on Saturday. In a chaotic summer at Stamford Bridge, Sarri was only officially announced as Antonio Conte's successor a month before the new season got underway, FIFA's goalkeeper of the year Thibaut Courtois went AWOL to force a move to Real Madrid and Hazard also expressed interest in a move to the Spanish giants. Yet, rather than fall further behind after finishing sixth and 30 points adrift of Manchester City last season, Chelsea have stolen a march on Manchester United, Tottenham and Arsenal to nestle alongside City just two points behind leaders Liverpool. However, the acid test for where Chelsea's title ambitions stand will come when Liverpool visit on Saturday looking to extend their 100 percent start to the Premier League season. Sarri has repeatedly insisted his side can't yet be compared to City or Liverpool in their third full seasons under Pep Guardiola and Jurgen Klopp. "We have started to work together 40 days ago. So for us I think it is a bit early," said the Italian. "We have to work, we need to improve and then maybe, in one year, we will be at the same level of Liverpool." However, his transformation of Chelsea's style from the cautious approach of Antonio Conte to a side that asphyxiates opponents by dominating possession has been so seamless, a title challenge can't be ruled out. "The biggest change I ever saw in such a short space of time. Wow. Style completely different. What a manager he is, to be honest," said Klopp admiringly this week. While Chelsea struggled in Conte's second season, they also boast much more title winning experience than Liverpool with many of the same squad having won the Premier League in 2014/15 and 2016/17. "People were always talking about City being clear, and completely forgot Chelsea," added Klopp. "This team is really experienced. It won the title before, 80 per cent won it twice, and they know how it works. That’s a really strong football team." Chelsea also have Hazard, who showed his class by coming off the bench to score an incredible solo goal to inflict Liverpool's first defeat of the season in all competitions in the League Cup on Wednesday. Sarri has challenged the Belgian to follow the example of Liverpool's Mohamed Salah last season by scoring 40 goals in a campaign for the first time in his career. Salah was let go by Chelsea after making just 19 appearances, mainly as a substitute, but fulfilled his potential in an incredible 44-goal debut campaign at Anfield that saw him finish ahead of Hazard and Lionel Messi in third place for FIFA's best player of the year on Monday. The Egyptian hasn't been in such sparkling form at the beginning of this season, but looked back close to his best by scoring in a 3-0 cruise past Southampton last weekend. Klopp will be hoping that upward trajectory continues in what is also a massive week of Liverpool's ambitions both for a first Premier League title in 29 years and in Europe. After facing Chelsea, Liverpool travel to Napoli in the Champions League on Wednesday before hosting City at Anfield next Sunday. Klopp's men took just one point from five away games against the rest of the top six last season. Having already won at Tottenham a fortnight ago, another big win on the road will be a strong statement of intent.